The ground wires used on the 1980 - 86 Ford trucks. And, not much is said about the various ground wires that were used, so I'm attempting to document them here. Here's the only diagrams I find in the EVTM for them, with the green being my addition:. Note that the only combined engine/frame ground cable is shown for the diesels. 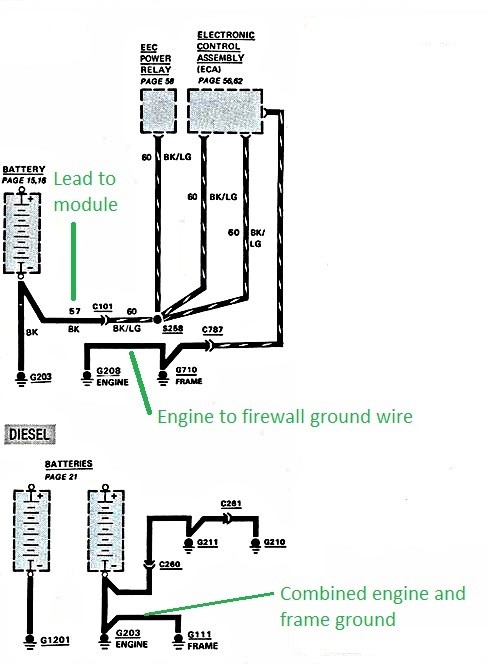 Also, note that the engine/firewall ground is said to go to the "frame" in the illustration. However, in the list of grounds it is said to go to the "left hand side of the dash panel", which means the firewall. And, in the illustration on the following page for this ground wire you'll see that another illustration in the EVTM shows it going to what we call the firewall. So, the "frame" is a mis-print.